Fish blaff or seafood blaff is to Saint Vincent and the Grenadines (and to the West Indies in general) what court bouillon is to metropolitan France. However it is spicier and more flavored. In the heart of the Caribbean, the 32 islands of the beautiful archipelago of Saint Vincent and the Grenadines (SVG) are appreciated by stars and internationally renowned personalities. They have a natural beauty that most visitors describe with a word : idyllic. It is called “the country of the blessed”, a country where life flows slowly and calmly, between volcanic beaches and beautiful mountains covered with forests. Saint Vincent and The Grenadines, this island state of the Lesser Antilles, is on the border between the Atlantic and the Caribbean Sea. It is located north of the island of Grenada and south of St. Lucia and is governed by the United Kingdom, Queen Elizabeth II is the head of state. In the Caribbean, Creole cuisine is a women’s business. 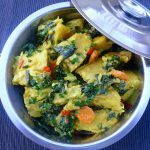 A cuisine for men who truly appreciate the good solid dishes and no West Indian woman loses sight that the way to the heart also goes through the way to the stomach! 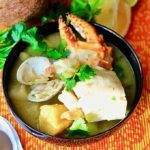 The cuisine of St. Vincent and The Grenadines is essentially Creole and maritime, so there are many fish, seafood, and poultry. The cuisine of the West Indies is a reflection of all those who lived there. It is characterized by a variety of dishes and gourmet styles from around the world. With regard to St. Vincent and the Grenadines, the local specialty is lobster. 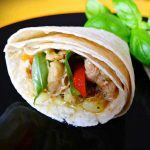 It can be eaten grilled, steamed, baked or in sauce. Among the most used ingredients in the gastronomy of Saint Vincent and the Grenadines, you can find different varieties of fish, among which: bonito, ruffle, dolphin, conch, buccini, prawns, lobsters and other seafood. Maranta starch (from arrow root) is a kind of starch, just like tapioca or potato starch, which is widely used over there. It is extracted from the tubers of maranta arundinacea. The root can be consumed like potatoes: fried, roasted, steamed, mashed or sweetened. Another tuber that is used in Creole cuisine is taro (Colocasia esculenta). But beware, as taro contains calcium oxalate crystals that makes it absolutely harmful and potentially fatal if ingested as is. The oil down of Granada or the taro rösti of Palau are delicious recipes using this tuber. Spicy seasonings, grilled meats, smoked meats and fish, or cassava flour in certain preparations are the legacy of the first inhabitants of the West Indies, the Arawaks. Dombrés, matete of crab (which is similar to the Spanish paella), or fish blaff are of Dutch origin. 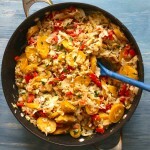 The West Indian calalou, a dish made from crab and okra, is native to West Africa. The congo soup, a Christmas specialty, made from beef and pork, comes from African ancestors from the Congo during the period of slavery. Colombo, the emblematic West Indian dish, is a legacy of Indian cuisine. 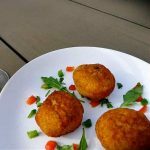 The famous accras de morue (salt cod fritters) are a legacy of the Kingdom of Dahomey, an African kingdom encompassing Benin, Togo, and Ghana. What is the origin of the word blaff? Let’s go back to blaff. The word blaff comes from the Dutch blaffus, coming from the Latin blaffatis, which means “fish cemetery”. 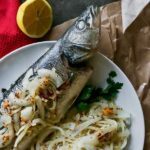 Although the word blaff and even its recipe probably have more of a Dutch colonial origin, it is also said that its name would come, according to the legend, from the noise that the fish makes when it is thrown in the broth, a splash or “blaff”! Fish blaff can be prepared with all varieties of fish and/or seafood. It is divinely scented with lime and white wine and spiced up with peppers and allspice. 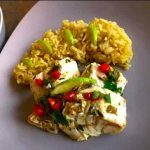 Rice pilaf is the friend of the fish blaff! Pilaf is more the name of a cooking method than that of a recipe. It is a common cooking method in the Balkans, the Middle East, Central Asia and South Asia, Africa, Latin America, and the Caribbean. The word “pilaf” comes from the Turkish word pilav, coming from the Persian polow (پلو) and, even before, from the Sanskrit pulāka (पुलाक), literally meaning “piece of boiled rice”. The current term has been influenced by the Greek word pilafi. Due to the worldwide spread of the dish, the term has derived in plov, polou, palov, pilau, pilaw, etc. Today, it is a dish that is popular throughout the Middle East. Variations exist among Persians, Arabs, Turks, Armenians and Azeris. It was introduced in Israel by the Jews of Bukhara (Jews from Central Asia) and Persian Jews. In Afghan cuisine, kabuli palaw (kabuli pulao or qabili palaw) is made from basmati rice, mutton, lamb, beef or chicken. Kabuli pulao is cooked in large, shallow, thick dishes. Carrots and raisins are added. Chopped nuts, pistachios, or almonds can also be added. Kabuli pulao with carrots and raisins is also very popular in Saudi Arabia, where it is also known as roz bukhari which means bukhara rice. Armenians do bulgur pilaf instead, called lapa. It is an Armenian word that has several meanings, including “boiled rice, thick rice soup, mashed potatoes”. Azerbaijani cuisine offers more than 40 different pilaf (plov) recipes. One of the most famous dishes is the rice plov covered with saffron, served with various herbs and green vegetables. Cooking pilaf has traveled to Brazil and is known as arroz de frango desufiado or risoto de frango. In Central Asia, in Tajikistan and Uzbekistan, pilaf, palov, plov or oshi is cooked in a rich stew of meat, often lamb, and vegetables called zirvak, until the liquid is absorbed by the rice. In Greek cuisine, piláfi (πιλάφι) is a soft rice cooked in a meat broth. In northern Greece, it is baked. In Bangladesh and India, rice pilaf is known as pulao, polao, and pulav. Rice has been an integral part of Indian cuisine since ancient times. A pulao is a dish consisting of rice and a mixture of lentils or vegetables, mainly consisting of peas, potatoes, green beans, carrots and/or meat, mainly chicken, lamb, pork but also fish and shrimp. A pulao is often accompanied by raita. In Iran, people eat polo, rice cooked in a broth while the grains remain separated, chelo, plain white rice, kateh, glutinous rice, and tahchin, slow cooking rice cooked with vegetables and meat. In Pakistan, people eat pulao, a basmati rice cooked with camel meat accompanied by raita. In Syria, traditional Levantine cuisine includes a variety of pilaf called maqlubah traditionally cooked with meat and eggplant. Turkish cuisine consists of many types of pilav and is the inspiration for most variations in Armenia, the Balkans, Greece and the Arab countries because of their past under the ruling of the Ottoman Empire. Among these variations are pirinc pilav (rice), bulgur pilav and arpa şehriye pilav, made from orzo. Using mainly these three types, the Turks prepare many dishes such as perdeli pilla and etli pilav (cooked with cubed beef). 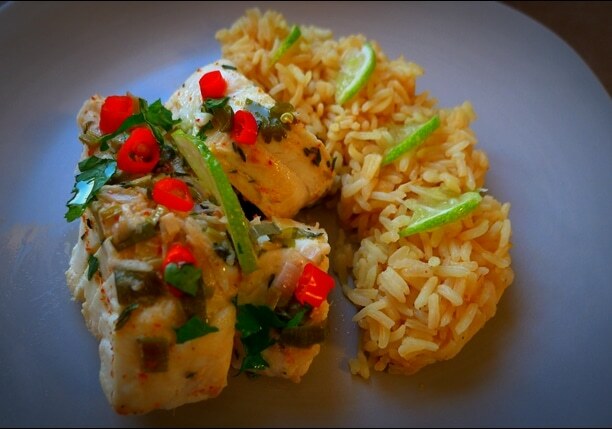 Any white fish can be used to make a fish blaff, the snapper would do very well but you can also use mahi mahi. Sa té bon toubolman. Bon lapéti! 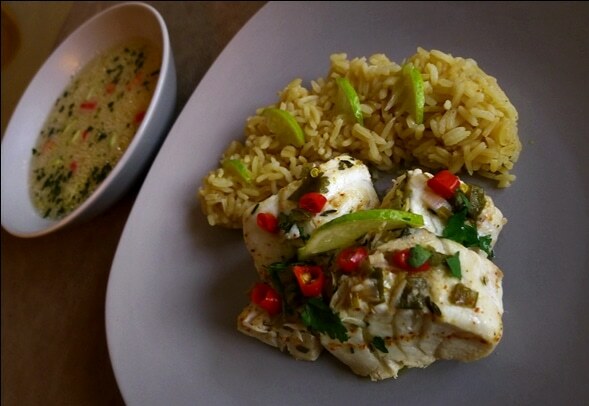 Blaff is traditional recipe that is popular in the Caribbean where the fish is poached in its own marinade. It is served with rice pilaf or vegetables. Mince the onions and spring onions with the stems. Squeeze the limes. Cut the hot peppers into thin slices. Chop half the parsley. In a bowl, place all ingredients and mix. 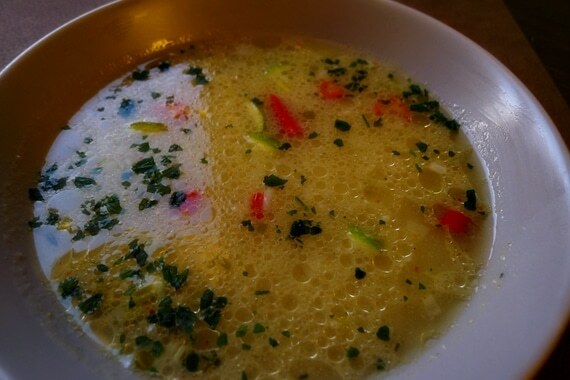 Add the cod and drench in the mixture. Cover with plastic wrap and marinate in the refrigerator for two hours (or more if possible). Pour the marinade into a large pot. Pour the white wine, water, oil, thyme, salt, allspice and cloves. Dip the fish in the sauce. Boil this mixture over high heat for 3 minutes, then reduce heat and simmer 15 minutes. Sprinkle with remaining parsley. Simmer uncovered for 10 minutes over low heat. Serve with rice pilaf and/or vegetables.